Note: This blog post was updated on August 7th, 2018 to provide the most comprehensive and accurate information. The post was originally written by GARRETT SMITH. We all know the capabilities and endless feature set of Asterisk. It’s a powerful, software-based PBX, that’s possibilities are endless. Asterisk is distributed in a number of ways, the first being the open sourced distribution that is command line driven. This distribution, 15.5.0 being the latest stable version can be downloaded from here for free, then compiled with a version of Linux, such as UBUNTU or Centos, and then administered from the command Line CLI interface. Then we have your open sourced asterisk-based distributions freely available to the public for download. These versions would include trixbox CE, Elastix, FreePBX, PBXinaFlash, and Asterisk Now, which just names a few. The separator between these software applications as compared to the command line asterisk distribution is that while asterisk source code is running in the background, the majority of configuration changes can be made via a Graphical Web GUI interface from both a user and administrators perspective. These software applications also allow for asterisk cmd line access or CLI access in order to make changes if required. Companies such as these have taken the asterisk source code and “rounded” it to their own unique application. And last but not least, we have our commercial asterisk based PBX’s. Most notability would be Switchvox SMB or SOHO software which is asterisk based, but no access is granted to the asterisk CLI. Rather all configuration changes are done via a web GUI interface. Software from Switchvox is considered a “paid” commercial product, which distinguishes itself from any of the open source based distributions mentioned above. With all flavors of asterisk, each meets its own unique need and fulfillment in individual VoIP deployments. When it comes to purchasing an IP PBX, you have your choice of asterisk software and also hardware to go along with it. In all regards, whether you choose the free open source cmd line version of asterisk or pay for Switchvox’s award winning SMB software, all solutions present you with a powerhouse feature set and customizability to meet your unique business needs. A short list if asterisk’s feature sets can be found here . Until most recently, the majority of IP PBXs being deployed were of an asterisk flavor based on a Linux operating system. While companies such as trixbox, Elastix, Switchvox, and many others have made great efforts to take the Linux programming piece out of the picture, the solutions are still Linux based meaning when it came time for your choice of hardware or server to run your asterisk solution, you needed to make sure the motherboard and peripheral components were compatible. See my previous blog posts relating to Open Source Hardware Requirements for more information. If you were not designing your own server platform, of course you could always purchase a Switchvox appliance for your SOHO or SMB solution, or a Rhino or Phoneboch’s appliance preloaded with your desired version of trixbox CE, Elastix, or other open sourced based software. This, however, adds to the cost of your solution. 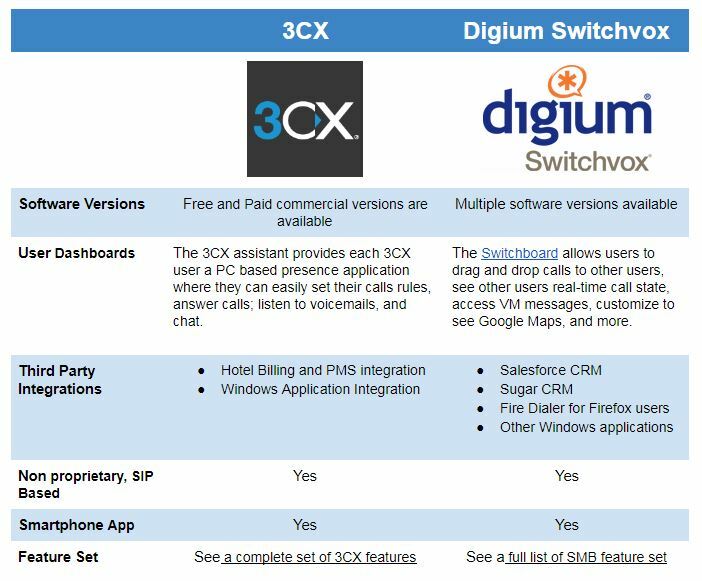 For the following comparison, I would like to focus on Switchvox SMB software and its comparisons against a new Windows-based PBX, 3CX. The reason for this is that both solutions are “paid” commercial software based applications. Pitting these 2 up against one another would make the most sense from a cost, feature set, and positioning standpoint, so onward to the comparisons. It is completely software-based and allows you to use existing Windows servers in your existing environment if available. Windows Application Integration support– applications such as Microsoft Exchange, Outlook, Unified Messaging, Microsoft CRM, and SalesForce CRM are all fully supported on 3CX version 9. Feature-rich – functions and feature sets of 3CX are very comparable to an Asterisk distribution. See here for a complete set of features. Free and Paid commercial versions are available to experiment with and test. Free versions of 3CX software are easily upgradable to any commercial paid version. User Dashboards– the 3CX assistant provides each 3CX user a PC based presence application where they can easily set their calls rules, answer calls; listen to voicemails, and chat. Hotel Billing and PMS integration- On top of their paid software platforms, administrators can add the 3CX Hotel Billing, or the full-blown Hotel PMS integration module to easily integrate Hotel PMS platforms with 3CX. This is a huge hit in the hospitality industry. More information on this support can be found here. For pricing on the software add-ons, see the billing and PMS products on VoIPSupply.com. Non proprietary, SIP Standards-based – Since the 3CX solution is based upon SIP protocol, administrators have the ability to use any SIP-based endpoints such as IP Phones, Gateways, ATA’s ,and DECT Phones . Furthermore 3CX has fully tested a large number of these endpoints and offers full support including auto-provisioning. If you are looking to add some PCI cards to the solution, you will want to go with a Sangoma PCI FXO or T1 Netborder Express card with echo cancellation. Now onto the Switchvox SMB platform. Feature Support- I always like to refer the SMB platform as Switchvox’s “Big Daddy” PBX, the reason behind it is simple; it is jammed packed with features for both users and administrators. A full list of SMB feature set can be found here. Multiple software versions available- If SMB is too much for you, you can opt for Switchvox SOHO or HOME versions which are more limited in functionality and cheaper in costs as compared to the SMB solution. Also, Digium offers a FREE 60 Day Trial of the full-blown SMB software, so you can “test drive” the actual SMB solution before making your purchase. If you are interested in test driving the SMB solution, contact our VoIP experts at 1-800-398-8647 for details! User Dashboards- Personally, The Switchvox Switchboard, ONLY available with SMB is one of the most intuitive presence applications on the market, and it all comes bundled with your SMB solution. From the Switchboard, users can drag and drop calls to other users, see other users real-time call state, access VM messages, customize to see Google Maps, integration with CRM accounts, Queue status, CDR, Chat, and the list goes on. If you would like to see the switchboard in action, just watch it here. Nonproprietary SIP-based endpoints- While SMB has built-in auto provisioning support via is Provisioning Token system for all Polycom and Snom IP Phones, it is SIP-based, so any SIP endpoint including IP Phone, gateway, ATA, etc will function. If you are looking to add some PCI cards to the solution, you will want to go with any Digium PCI card for your FXO/FXS, or T1 connectivity. Echo cancellation models should also be considered. Smartphone Apps- Digium Switchvox offers a Smartphone application for both apple based products and Blackberry’s. For you Droid users, sit tight, you will get yours soon. The application allows users to create and modify their call rules, access VM, and call into the Switchvox PBX. More information can be found here. So what do you think? Cost aside, which one would you choose and why? I prefer 3CX for it ability to complete microsoft exchange… this is the perfect tool I was looking for with voip in my network. I was using 3CX for a couple of months on a “cloud” based system in our datacentre, connecting phones from our office remotely. Had one problem after the other with it and today it has just stopped working overnight for no reason at all. Calls come in but no audio, and no outbound calls. Spent the whole day trying to fix it but no joy hence given up. Trialling the TrixBox now so hopefully that works out to be a lot more reliable and stable a system than 3CX. Harry – it really looks like you did not properly configure your firewall – as the problems you are citing have nothing to do with 3CX Phone System. 3CX is great very very great and it does live up to what it says it would be… I use 3Cx paired with Callcentric, so 3CX is being purely used as PBX Box… therefore the commercial license is not necessary… there’s only one huge trouble that sent me back to Trixbox, we are a translation agency and also provided language training… it is very important that we can jump from one language to another… and no matter how great 3Cx is, that feature is not there yet. I did create a special Digital Rep and recorded a French prompt, but the back end will still be in English… in our industry it’s unacceptable. I really hope that 3Cx understand how important that feature is and add it up soon. In the mean time I decommissioned the 3Cx server and run Trixbox that does a tremendous job too… but frankly I so much of a Windows admin, when entering CLI in Linux I always mixed the command. So if ;you guys don’t need language feature I strongly recommend to try 3Cx. We were using Trixbox and then Asterisk NOW and found them both a nightmare! So recently we switched to the free version of 3cx and are loving it! No calls dropping out, easy to configure – it just works and works well! I would recommend 3cx to anyone considering a VOIP solution. So what do you think? 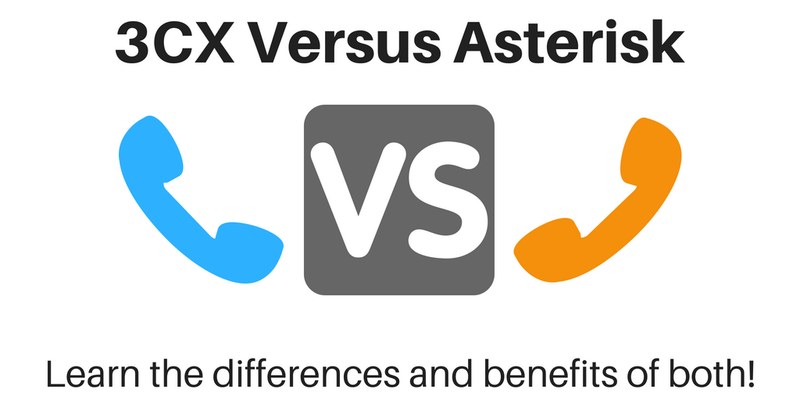 I and looking for Asterisk Versus 3CX and the PBX comparisons. which one would you choose and why? We (my company) looked into Both 3CX and Asterisk, tried several flavors of it. Never really liked 3CX, and once we tried Swtichvox, we went that direction with no regrets. It gives you a platform with plenty of features out of the box, and if you are thinking of customizing it, there is a vibrant community to do it. and would select it over asterisk any day. Only somone who doesnt know how to use Asterisk would think 3cx is better then Asterisk. A Linux User would choose Asterisk and a Windows User would choose 3cx.